This #ELGLPopUps summary post is provided by University of Washington Evans School student Nora Carroll, who received a scholarship from OCCMA to the event in Portland. 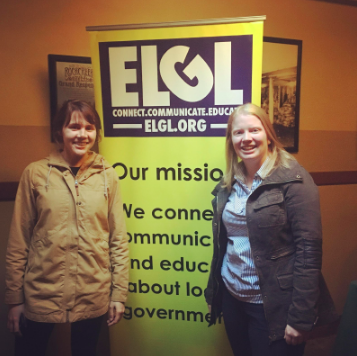 Attending my first ELGL Pop Up conference was no disappointment. It was a great day filled with enriching conversation surrounding local government topics and an opportunity to meet fellow passionate local gov professionals. There was a lot to take away from the conference but the biggest lessons for me surrounded the themes of engagement, leadership, failure, and justice. The discussion surrounding IAAF World Championship preparation highlighted the need to engage with the community from the start. Recognizing failures of the past, Oregon 2021 staff made a concerted effort to reach out to the community when planning the new track field. Their efforts allowed for the community and planners to memorialize certain parts of the field and move forward with the construction of the new track. Engaging with stakeholders was a crucial step to the 2021 planning process and will remain an important part of future steps. The excitement surrounding 2021 and big planning has provided the capacity and willingness of community leaders and residents to take on other issues. Intentionally engaging with the Eugene community has proven to be an essential aspect of 2021 and their continued involvement and participation will allow the event to be success. The panel of current local government officials created great discussion surrounding leadership. As a soon to be graduating student looking to the join the local government profession, this panel was especially insightful. What resonated with me were the lessons of being open, not waiting, and needing a continued thirst for improvements. Leadership can come from many paths and you may not follow the “traditional” route. It is also important to get comfortable with being uncomfortable. I immediately connected with this advice as many of my experiences as a grad student have included adjusting to being uncomfortable and leaning into the “unknown”. It is important in local government to rid the notion that failure is not allowed. To be a smart community, you need to be able to take some risks. With Independence, OR they found that on a limited scope, they could afford to fail. Leadership shook the notion that government cannot fail by defining where it is okay to fail. With local government, you can start small and pick a reasonable scope. Pushing your community to not sit still allows for greater opportunity. In order for the process to succeed you do not have to take on big projects, you can build incrementally and build political support along the way. As you build success, the community will have more faith in the process and more willingness to fail. The overview of the Coalition of Communities of Color’s Leading with Race: Research Justice in Washington County was a top moment at the pop up conference. The work that was accomplished in the report was empowering and highlighted the need for continued efforts in research justice at the local government level. It is critical to have the communities of color participate as researchers, knowledge producers and communicators. The report stressed that communities of color in Washington County have always lived there, enjoy living there, and are an essential part of the economy and social fabric. The report’s call to action will be an important framework for future work in local government at every level.